iTunes Movies are not really yours, did you know? You should read this. ITunes story made me think about my movie purchases. I have purchased 7 movies on Amazon that they hold in their system. I have resisted buying any from Apple. My wife asked me about those movies and wondered how we are supposed to keep track of what we buy and where we have all these things. It is easy for me to jump through and find what I want and just as easy for my son and daughter, but my wife is a bit more tech challenged when it comes to these things. I never thought about whether or not I actually owned those movies on Amazon though. I have 25+ movies up there and 100+ books and even more audio books. 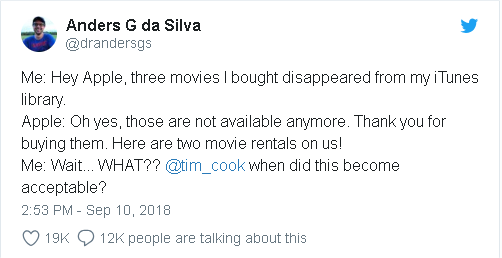 That really got me thinking about iTunes movie issue. What does Amazon say about this? Do I truly own those movies? There is no easy way to download these movies. So I am renting them in perpetuity I guess. In the good old days. If I purchased a CD or cassette tape I owned it on that medium. I could give it to a friend to use and they would give it back to me. Or sell it to someone. Now, you can’t resell or even give it to someone to borrow. As long as Amazon stays in business I will be ok, but that is still not good enough. I need a backup of my stuff. See, I have had this happen to me before that my dog did indeed eat my DVD collection. He was a puppy and wanted to see what plastic tasted like. Thank goodness I make a copy of every DVD I have purchased. Yes, it takes a ton of space on my NAS, but if I didn’t I would have lost a few hundred dollars of my videos. h. Limited License to Digital Content. Subject to payment of any charges to rent, purchase, or access Digital Content, and your compliance with all terms of this Agreement, Amazon grants you a non-exclusive, non-transferable, non-sublicensable, limited license, during the applicable Viewing Period, to access and view the Digital Content in accordance with the Usage Rules, for personal, non-commercial, private use. We may automatically remove Digital Content from your Compatible Device after the end of its Viewing Period. i. Availability of Purchased Digital Content. Purchased Digital Content will generally continue to be available to you for download or streaming from the Service, as applicable, but may become unavailable due to potential content provider licensing restrictions or for other reasons, and Amazon will not be liable to you if Purchased Digital Content becomes unavailable for further download or streaming. You may download and store your own copy of Purchased Digital Content on a Compatible Device authorized for such download so that you can view that Purchased Digital Content if it becomes unavailable for further download or streaming from the Service. iTunes movies are hard to download. So is Amazon and I would guess most other online video items. My audible is pretty easy to get around as you could easily record the audio with your system and make and MP3 of it. The videos, well that is a bit different as you can play the video and then record that from your screen? What sort of quality can you really achieve? I don’t know for sure as I have not tried it, but maybe it is worth a go. I would hate to lose those 20 some movies I have.